You know John Lennon, Paul McCartney, George Harrison and Ringo Starr, but do you know the fifth Beatle? 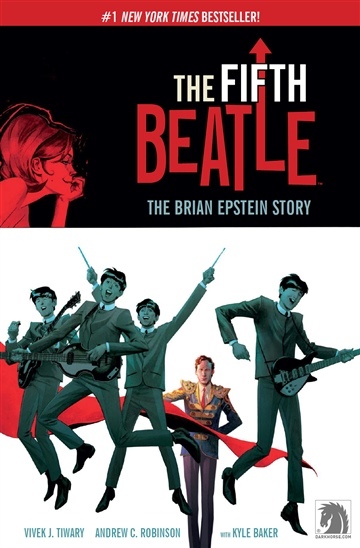 Equally inspirational and heartbreaking, THE FIFTH BEATLE is the graphic novel debut of Tony Award-winning Broadway producer Vivek J. Tiwary (Green Day’s “American Idiot”) and is illustrated by acclaimed artists Andrew Robinson (Starman) and Kyle Baker (Nat Turner). THE FIFTH BEATLE is more than just the untold story of the man who created Beatlemania, it is a timely and timeless exploration of pop culture, music, sexual identity, prejudice and the idea that all you need is love. Tiwary found an historical mentor in the Beatles’ manager, relating to Epstein’s outsider status while being equally inspired as both an artist and a businessman by the transcendent success and heartbreaking failure. Brian Epstein overcame great obstacles--he was a gay man in a time and place where homosexual acts were deemed a felony in the United Kingdom, Jewish at a time of pervasive anti-Semitism, and he hailed from Liverpool, at a time when it was considered just a dingy port town. Although Epstein helped spread the Beatles’ message of love to the entire world, he died lonely at the young age of thirty-two, consumed by his own staggering ambition, with no succession plan for the pop culture sensation he helped cultivate. Originally published to widespread acclaim in October 2013, THE FIFTH BEATLE is the winner of the Will Eisner Award for Best Reality-Based Work, 2 Harvey Awards (including Best Original Graphic Novel), a finalist of the Lambda Literary Award for Best LGBT Graphic Novel, an American Library Association Great Graphic Novel for Teens, and is included as part of the Rock and Roll Hall of Fame Library and Archives Permanent Collection in conjunction with Brian Epstein’s official induction. Earlier this year it was announced that Sonar Entertainment optioned the rights to THE FIFTH BEATLE and it will be developed as a multi-part event series with Tiwary adapting his work for television and serving as executive producer. The long-awaited paperback edition includes a sketchbook and Beatles memorabilia bonus section with never-before-seen material and behind-the-scenes insights from Tiwary, Baker and Robinson.